The family of nine-year-old Raychel Ferguson, whose death was examined by the child fluid death inquiry, have accused the Directorate of Legal Services (DLS) of being involved in a “cover up” and said its conduct was “appalling” . In a submission to the inquiry, the legal unit of the health service in Northern Ireland was also accused of causing “immense stress” to bereaved families and “wasting public time and money”. The DLS has strongly denied this. In new closing submissions published on the Hyponatraemia Inquiry’s website, the legal team representing the Ferguson family say the DLS’s legal duty to the medical profession can conflict with a doctor’s duty of care to the general public and called for further scrutiny of its role in Northern Ireland. The DLS provides legal representation to health trusts in Northern Ireland. A spokesperson said it strongly refutes any allegation of a cover up in any cases being examined by the Hyponatraemia Inquiry. The legal teams for each of the families and organisations being represented at the inquiry were asked to submit closing submissions following the completion of the inquiry’s oral hearings. The submissions only entered the public domain when they were published on the inquiry’s website at the end of last week. Nine-year-old Raychel died after an appendix operation in Altnagelvin Hospital in June 2001. The Hyponatraemia Inquiry examined the role that fluid mismanagement played in her death. Its public hearings have now finished and its report is due to be presented to the Health Minister. It is also examining the deaths of Adam Strain (4) and Claire Roberts (9) as well as the events following the death of 17-month-old Lucy Crawford and specific issues arising from the treatment of 15-year-old Conor Mitchell. For more background information on the issues being examined by the Hyponatraemia Inquiry please click here. The inquiry is chaired by Mr Justice John O’Hara. The report was due to be published early this year but a publication date has not yet been set. 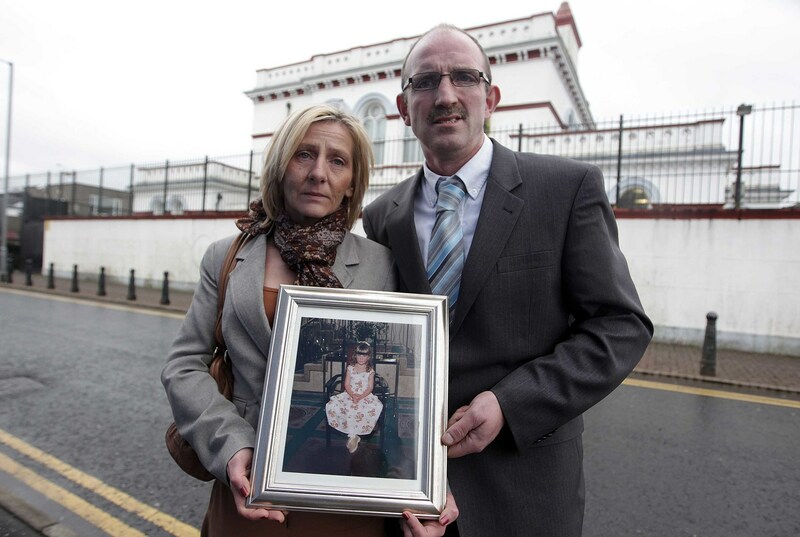 The Ferguson family’s criticism of the DLS is particularly focused on an expert report commissioned by the then Altnagelvin Trust which the inquiry learned had not been passed onto the coroner’s office ahead of or during Raychel’s inquest in 2003. Ahead of the inquest, the trust’s legal team had commissioned reports from a senior Northern Ireland paediatrcian, Dr John Jenkins, on the subject and also a Dublin-based paediatric anaesthetist, Dr Declan Warde. Dr Jenkins initially reported back that he needed more information while Dr Warde’s report strongly suggested that the hospital was at fault, referring to “severe and protracted” vomiting by Raychel. The inquiry heard that Dr Warde’s report was subsequently shown to Dr Jenkins who reported back to the trust and its legal representatives on it. Dr Jenkins then produced a third report – the only one of the three he had written which was given to the coroner – which concluded that he believed doctors and nurses had acted according to established custom and practice at the time. The inquiry heard that a hand-written note among the DLS documents shows that a phone call had been made to Dr Warde’s home and his wife was asked to tell him that he would not be needed to give evidence at Raychel’s inquest. Dr Warde’s report was also not given to the coroner – a move the DLS has pointed out is within its rights under rules governing privilege and inquests. During the course of the inquiry, evidence was heard that in Northern Ireland there is no statutory or common law in relation to duty of disclosure to the coroner. In its closing submission to the inquiry, Michael Stitt QC, on behalf of the DLS, defended the fact that the trust did not disclose the Warde report to the coroner. The letter published on the Hyponatyraemia Inquiry website states: “The point has been made that this would have been of benefit to the coroner. This may be the case but it does not mean that the Trust acted either illegally or in any way improperly in not disclosing the Warde Report to the coroner. A spokesperson for the DLS said that a further expert report by Dr Edward Sumner from Great Ormond Street Hospital in London, which also remarked on “very severe sickness” suffered by Raychel, was sent to the coroner’s office and was included as part of the inquest evidence. However in the newly published closing submission to the inquiry on behalf of the Ferguson family, Derry based solicitor Desmond Doherty says the family hope that the actions of the DLS will be “at the forefront of the inquiry’s mind” when the chairman’s final report is published this year. In August this year the DLS admitted liability in relation to the death of Raychel and apologised to her family on behalf of the trusts charged with her care. In the Ferguson family’s closing submission, Mr Doherty claims that the delay in the denial of liability is “indicative of a defensive culture and a failure to take responsibility at an earlier and more meaningful stage”. In his submission, he states: "For ten years the DLS were possessed of all the information to have allowed their client ‘on advice’ to admit fault and thereby ended an aspect of the parents’ anguish and distress. This must be a matter of profound concern. However in its closing statement to the inquiry Mr Stitt QC, on behalf of the DLS states: "A decision was made that the appropriate way to proceed in relation to the litigation was to await the inquiry report. A spokesperson for the inquiry said that a publication date for the chairman’s final report had not yet been set.